With tough matchups on its schedule, the No. 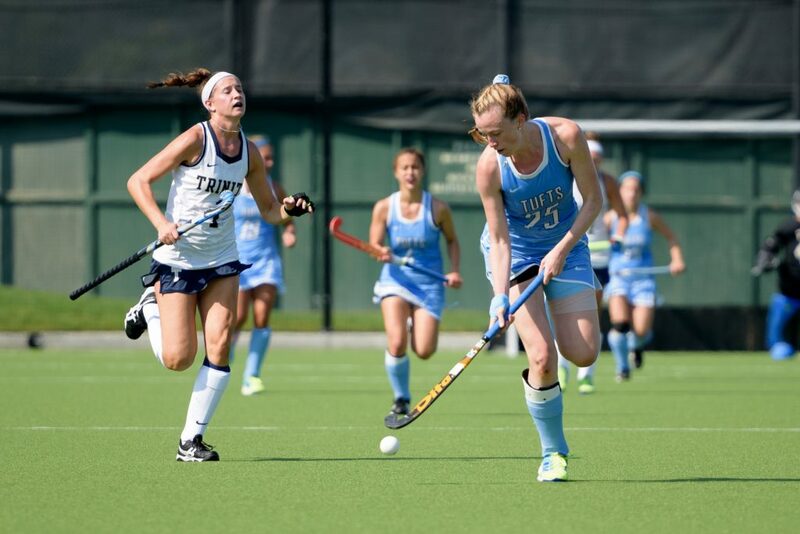 6 Tufts field hockey team persevered with strength and poise, gathering momentum as the season marches forward. On Tuesday, Tufts battled the Wesleyan Cardinals on foreign turf to remain undefeated in the NESCAC. When the two teams squared off last year, the Jumbos defeated the Cardinals 6–0. Paying little attention to history, though, the Jumbos went into the challenge with an unassuming mindset. Sophomore midfielder Brigid Gliwa put Tufts on the board 16 minutes into the first half with her first career goal off a penalty corner. Coming out of halftime with a 1–0 lead, Tufts jumped on the offensive. In the 57th minute senior forward Mary Travers found the back of the net off an assist from senior co-captain Mary Kate Patton. Just over five minutes later, first-year midfielder Beth Krikorian snuck one past Wesleyan sophomore goalie Delaney Wood for her first career goal as well. Wesleyan senior tri-captain Tierney Behles found a hole in the Jumbos’ defensive formation in the 67th minute and snuck a shot past Polinski. Time ran out on the Cardinals’ comeback, though, and the Jumbos walked away victorious, 3–1. Tufts took on No. 17 University of Mary Washington in Fredericksburg, Va. on Saturday. Both teams exhibited impenetrable defenses, and the intensity of the game was only matched by the conditions in which it was played. With the game locked in a scoreless stalemate when the final horn sounded, it went into sudden-death overtime. Because overtime rules dictate that a team can only have seven players on the field, physical fitness plays a significant role. “I had confidence that our forwards would get the ball into the other end of the field with the hopes of getting the corner and scoring, and that was what happened,” Polinski said. Sophomore forward Rachel Hamilton scored the Jumbos’ lone goal in the 78th minute of the game, and her first of the season off an assist from junior midfielder Fallon Shaughnessy. “Our team is really learning to focus on one game at a time and making sure that we’re ready for any obstacles that we face throughout the rest of the season,” Polinski said. Following a 1–0 overtime victory against the Mary Washington, Tufts returned to practice intent on fine-tuning its fundamentals. The players have been communicating well with each other and stepping up as a unit, according to Mattera. While the offense is looking deeper and more organized, it still isn’t clicking perfectly in the opposition’s defensive circle. Mattera stressed that she would like to create more shooting opportunities and improve shot placement in the next few games. The Jumbos took advantage of their practice time between the Wesleyan and Mary Washington contests, working on necessary adjustments in anticipation for the Cardinals. Having fought a long, grueling battle on thick field turf at Mary Washington, they knew that their ability to transition to Wesleyan’s AstroTurf surface would have a monumental effect on their performance. Tufts‘ focuses on passing into open space and getting into scoring position were evident in the victory against Wesleyan in Middletown, Conn. The Jumbos handed the Cardinals their third consecutive loss in the NESCAC, as the Jumbos added another mark in the “W” column. The Jumbos are now 5–2 on the season. On Sept. 20, Tufts played against MIT, its neighbor and strong competitor, in Cambridge, Mass. MIT improved to 6–1 on the season after its defense shut out Tufts’ offense for 70 minutes. While the game was certainly low-scoring, there was no shortage of attacking efforts from the Jumbos. With eight shots on goal in the first half and 13 shots on goal in the second half, Tufts was able to lock eyes on the cage many times, but failed to convert. Grace Moore, the first-year goalkeeper for the Engineers, filled up the stat sheet with 10 saves against the Jumbos’ 11 shots on goal. In contrast, MIT only fired two shots throughout the contest, one of which snuck past Polinski for the game-winner. Tufts, despite a few adjustments that were required to overcome strong challenges from both Wesleyan and Mary Washington, is on the rise as of late. The Jumbos emphasize taking it “one game at a time” as they make their way through the rest of the regular season. Tufts next visits No. 8 Amherst and No. 9 Hamilton on Saturday and Sunday, respectively, in the hopes of maintaining a perfect conference record.